The G Bar M’s pantry is fully-stocked. Maria brings together fresh, ranch-local meat and eggs, and vegetables gown right on the ranch. The fare is hearty, and the menu is diverse. 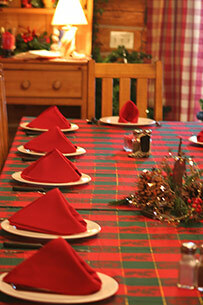 Everything is served family-style on the bountiful table where guests, family and crew gather at mealtime. For guests who have dietary restrictions or simply food preferences, Maria is more than willing to accommodate. Just be sure to let her know ahead of time. Recipes perfected by Maria have been in the family for generations. If the kitchen is the heart of the ranch, then the garden is the sustaining hands. The sprawling ranch garden is where salads, stir-fries, delicately seasoned sauces, and pies start on their way to the table. Go ahead! Walk between the rows and pick fresh off the vine. Local as we can possibly be. You want to talk bread? The Cooking Channel featured Maria’s homemade sourdough bread on their television show Pizza Masters. As they discovered in a bake-off held right in the G Bar M Ranch kitchen, the ranch’s 100-year-old sourdough starter adds an extra-special flavor that is dang near impossible to beat. The sprawling ranch garden is where salads, stir-fries, pies and pot roasts begin their journey. Just as you’ll enjoy this cavalcade of fresh produce in Maria’s meals, we invite you to walk through the rows with us and have some fresh off the vine. If the kitchen is the heart of the ranch, then the garden is the bare feet — heels and toes sinking into the fertile, living earth. Enjoy unity of all five senses as you pick your own fruits and vegetables and listen to the quiet sounds of our working ranch. Local as we can possibly be. Visitors cannot touch the garden.